The bride and groom take their first dance at Macedonian Hall in Crown Point, Indiana surrounded by amber lighting. All kidding aside, it was a wonderful day that started out at Downtown Hair Studio in Lowell where Jillian's mom and all around BFF got her make up done alongside her daughter. The bride's mom shares a laugh with her daughter. The bride gets her make up done at Downtown Hair Studio in Lowell. Lowell Methodist Church was right down the street and we hung the bride's beautiful dress from the balcony as light shined through the stained glass windows. The bride's wedding dress hangs from the balcony at Lowell Methodist Church. Jillian did not want Nick to see her before the ceremony so we did a peek-a-boo shot with the groom walking in blindfolded. We then took a cute picture of the happy couple after Jillian relieved him from the bandana blindfold. The bride and groom take a photo WITHOUT seeing each other before the ceremony. 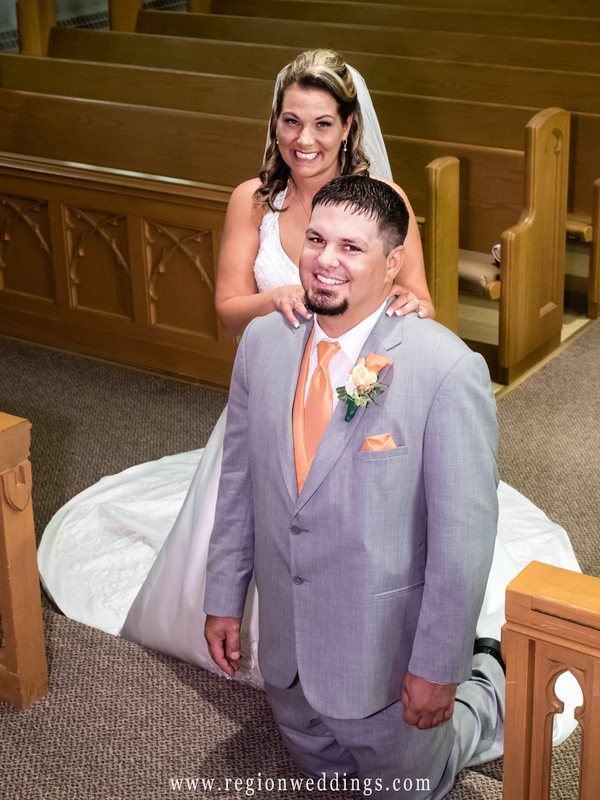 The church ceremony saw family and friends in the pews as the ring bearers announced the entrance of the bride. I loved the look of the vintage church, especially the cross that hung above during the ceremony. Ring bearers hold up a Here Comes The Bride sign. Wedding ceremony at Lowell Methodist Church. After family photos we went to Nick's grandmother's farm house in Hebron for couples and wedding party pictures. The neighbor's curious horse decided to photo bomb the couple as they kissed along the walkway. Too funny!! The bride and groom kiss as a curious horse looks on. The newly married couple gaze at each other with Indiana farmland as a backdrop. Macedonian Hall was all lit in an Amber hue thanks to DJ Shaun Kelly at Spinnin' Productions. 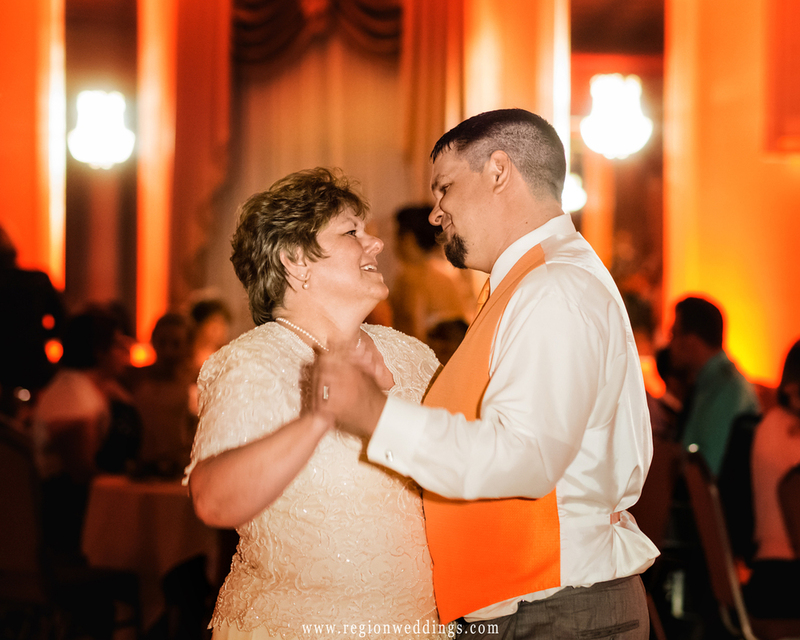 The groom danced with his mom and Jillian danced with the important men in her life. Mother and son dance at Macedonian Hall. 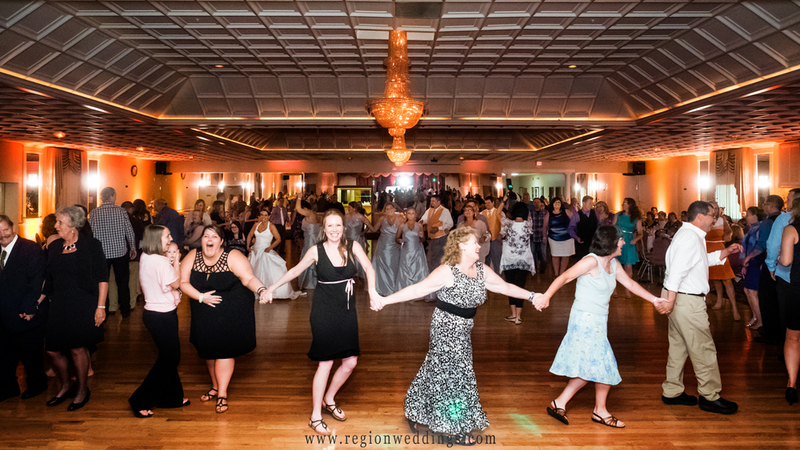 The large dance floor at Macedonian Hall was full as friends and family surrounded the couple in celebration. No one cared about the rain outside at this point. To all of us inside, it was already a beautiful night. Family and friends surround the bride and groom at Macedonian Hall in Crown Point. This is merely a sneak peek look at Nick and Jillian's wedding at Macedonian Hall. Stay tuned and subscribe to this blog below and visit the Region Weddings Facebook Page for more updates.